December | 2017 | 50 Westerns From The 50s. 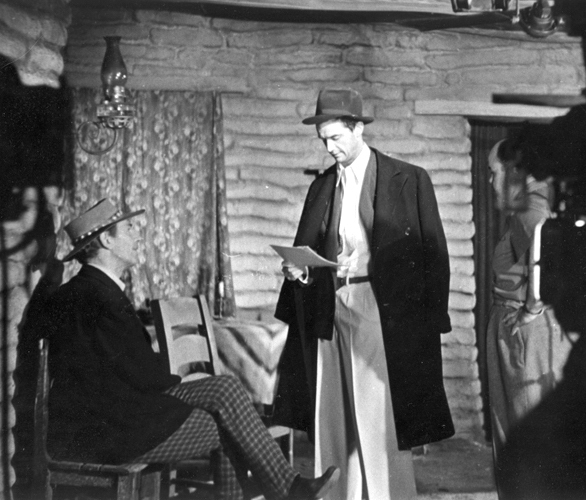 50s Westerns DVD/Blu-Ray News #256: Singing Guns (1950). 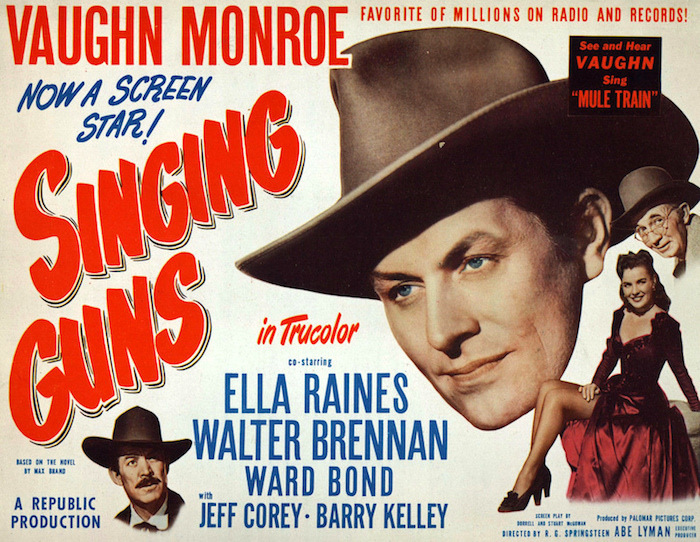 Kino Lorber is working on a DVD and Blu-Ray release for Singing Guns (1950), the first of two Westerns singer Vaughn Monroe made for Republic. The picture was slightly modified mid-stream to incorporate the song “Mule Train,” which became a massive hit for a slew of singers. It’s a pretty solid Republic Western — with great parts for Walter Brennan and Ward Bond. The 4k material from Paramount for this picture is incredible — easily as good as Kino Lorber’s release of Sunset In The West (1950). Not sure what the release date is — I’m working on a commentary for it now. 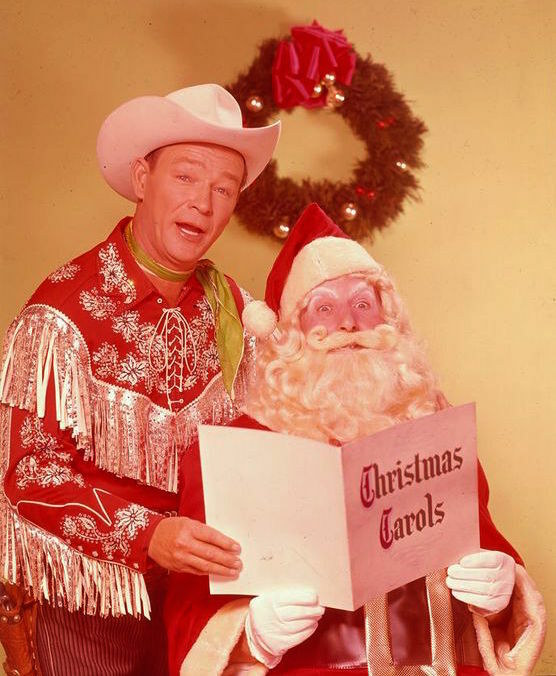 Here’s the King Of The Cowboys, Roy Rogers, with the king of Christmas, Santa himself, wishing you and yours a very merry Christmas. Here’s hoping you enjoy time with family, some fine food, and a 50s Western or two. Of course, I recommend Roy in Trail Of Robin Hood (1950). 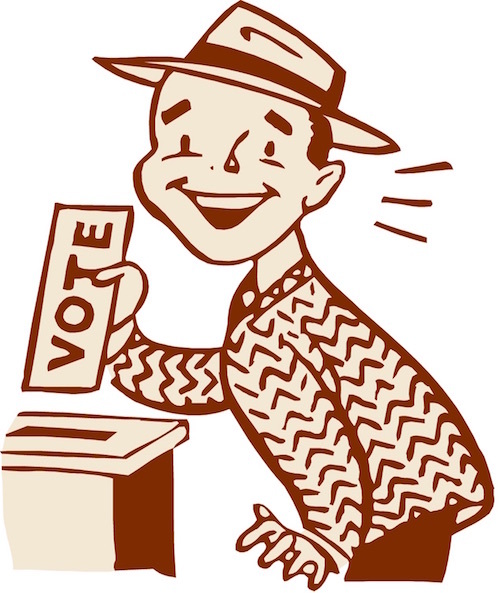 Get Your Votes In For The Best Of 2017. Between now and New Year’s Eve, send me your favorite DVD and Blu-ray releases for the year — I’ll do all the accounting and put together our Best Of 2017 list. The only requirements: they have to have been released during the 2017 calendar year, somewhere on Planet Earth, and have some relation to 50s Westerns. This will be the fifth year we’ve done this, and it’s always been a lot of fun. One of the real joys of this blog is the sharing and recommending that goes on. So while you’re at it, let me know what your biggest Discoveries were for 2017. Doesn’t matter if it’s been on DVD for years, you saw it on GetTV last week or borrowed a bootleg from a friend — what 50s Westerns did you get acquainted with this year? For both lists, drop your picks in the comments to this post or email fiftieswesterns AT gmail DOT com. And don’t collude with the Russians on your list. 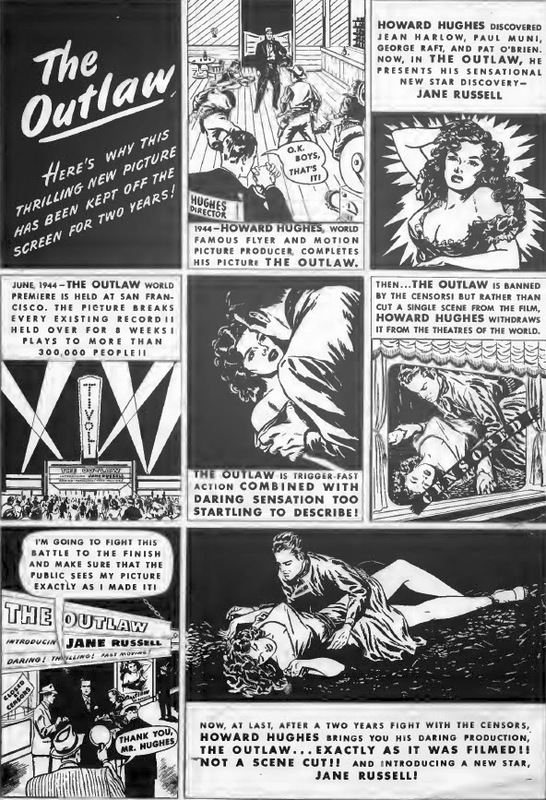 What do they know about 50s Westerns anyway? 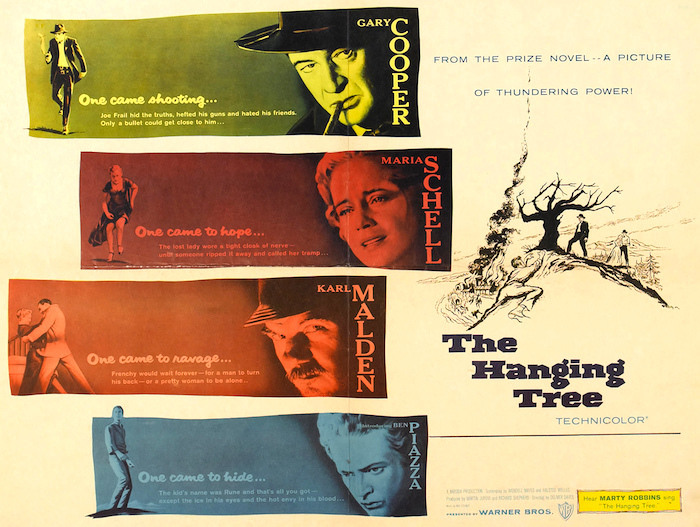 50s Westerns Blu-Ray News #255: The Hanging Tree (1959). Delmer Daves’ The Hanging Tree (1959) was a huge deal when Warner Archive brought it to DVD back in 2012. 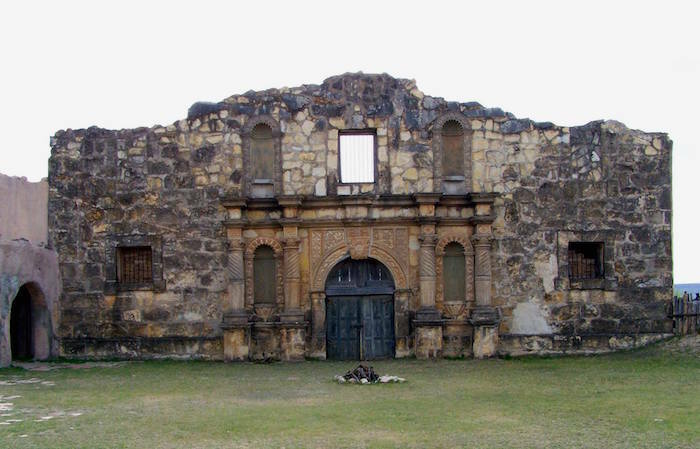 It’d been hard to find for years — and ratty-looking when you did find it. Now it looked pretty terrific. Warner Archive has announced an upcoming Blu-Ray rollout for The Hanging Tree in early 2018. Great news and a great, great movie. 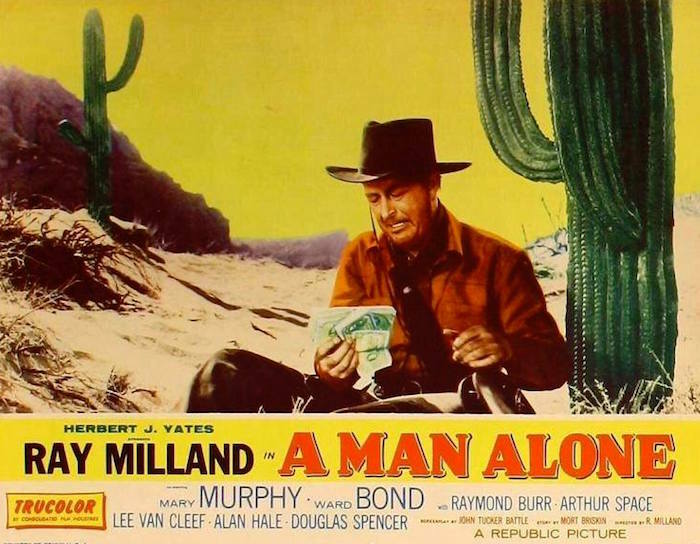 50s Westerns DVD/Blu-Ray News #253: A Man Alone (1955). Starring Ray Milland, Mary Murphy, Ward Bond, Raymond Burr, Lee Van Cleef, Alan Hale Jr.
Milland’s a gunfighter who’s accused of robbing a stagecoach. Mary Murphy lets him hide out at her place. Trouble is, her dad (Ward Bond) is he sheriff. Shot in Trucolor by Lionel Linden, and directed by Ray Milland, this should look gorgeous. I can’t wait.